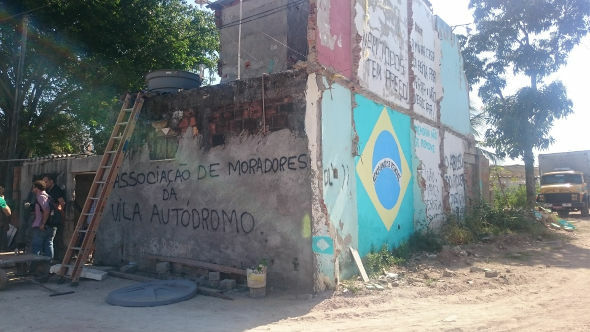 A small NGO is trying to link local communities and international networks to help Rio’s poorer areas, Ann Deslandes reports. All organizations and solidarity groups say they want good, real relationships. This small, independent NGO Catalytic Communities (CatComm) has worked very hard on relationships. They work with favela communities in Rio de Janeiro, the large, unequal coastal city in Brazil. CatComm has developed a lot of networks with community leaders and residents in the 1,000 favelas in Rio: civil society groups in Brazil, South America, USA, the UK, and other countries; academics in urban planning, architecture, social science, education, and environmental science; and editors and journalists from important media groups around the world. The organization has brought attention of the world to the people in the favelas. About 1.5 million people live in the favelas. Theresa Williamson (a Brazilian-British-American city planner) started CatComm in 2000, and she has a small team of many volunteers who have finished at university in North America, Europe, Brazil and Australia. So when the Summer Olympics came to Rio in 2016, people from the favelas were ready to tell the world about how people were suffering because of the Olympics. Many people wrote eg. in The Guardian, to change what people think about favelas – they are not only terrible places of crime. CatComm has had a media platform too since 2010: RioOnWatch. This is important for favelas trying to change what people think of them, and also important for all people who live in cities around the world. The rich Brazilians and the Brazilian government said the favelas were bad. The rest of the world didn’t understand them. But many favelas have developed their own solutions to many difficult city problems eg. bad sanitation, using too much plastic and other non-sustainable material, and provision of basic resources eg. housing people have enough money for, child care, education, and youth programs. The networks have also protected the communities in favelas when they have been attacked because of big events eg. World Youth Day in 2013, the 2014 World Cup, and the 2016 Summer Olympics. CatCommm doesn’t deliver aid, it builds relationships that help the people fight attacks by telling their stories. For example, in 2010, the city government decided to make everyone move out of Vila Taboinha favela. The people didn’t want to leave. They made an agreement to delay the eviction by 30 days, but the bulldozers arrived early, before the deadline, on 10 November. They began to demolish the houses they said (wrongly) that people didn’t live in. 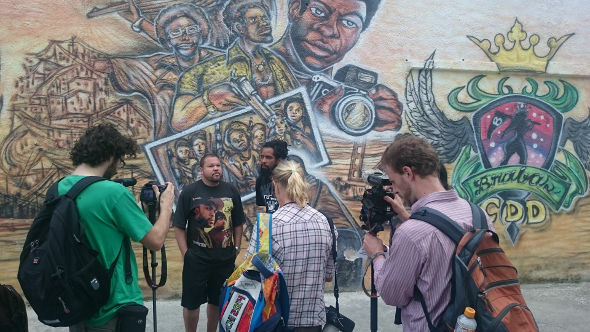 CatComm and other groups supported the Taboinha favela and two CatComm volunteers – from Australia and Canada – came to film the early demolition so they could use the film to fight what was happening. When the volunteers took out their cameras, the police took them. So people in Taboinha residents started to film the CatComm interns with their camera phones. The police then gave back their cameras. The driver of the bulldozer turned off the vehicle and left. He couldn’t continue without the police. Six years later, it was the Rio Olympics last year. Asa Branca, a favela near the Olympic Village got a higher rating for energy and environmental design than the Olympic Village. CatComm has often found out that favelas, that people build for their own community, have many good qualities that cities will need in the future. The world celebrated the Olympics. And Asa Branca celetrated 35 years of struggle in Rio’s West Zone. People often say favelas are chaotic and dangerous. But if you look closer, you will see the lively green urbanism that helps people live closely together. Williamson started CatComm when she was also writing her PhD, about the start of the organisation. She wanted CatComm to do something about how unfair it had always been that the poor people living in favelas can’t access wider social networks. The organization developed, and more people in the world saw and listened to people from the favelas. In August 2016 I went to Vila Autodromo (the favela that all the people had to leave so they could build the Olympic Village). I watched journalists from Australia, Canada, USA, Czech Republic, the Netherlands, UK, and France interviewing the residents of the last house that the bulldozers were destroying. They asked about the human cost of the Olympic Games, which was going to start in 24 hours. After this, many media companies talked about these problems: NPR, NBC, HBO, the BBC, and more, so tens of millions of people saw this. Not many people in the world knew that the people of the favelas suffered most from Brazil’s historic inequality. We didn’t know what they thought about this, or how they were solving these problems for themselves. But now, CatComm has brought their voices to everyone. Now there are better relationships between the favela communities and people who want to work with them, to help everyone. This page was last edited on 20 January 2017, at 23:35.